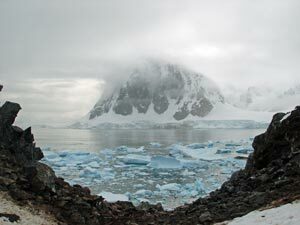 We had spent a snug night camping on Hovgaard Island - the cloud had kept temperatures up to around zero and the sleeping bags were very warm. 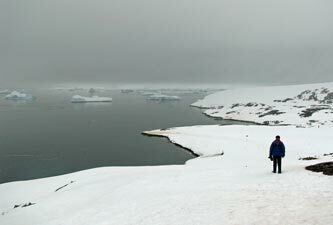 It had never quite got dark and the sun rose at 3.30am. 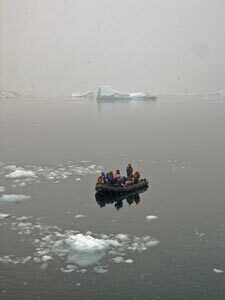 We were up before 6am to be greeted by a misty morning, the water of the sea almost glassy in the still air. 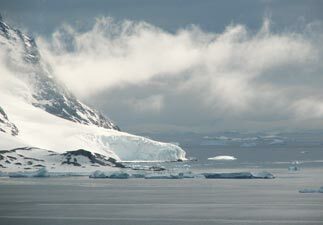 We broke camp, the zodiacs arrived and we were back on board the ship before 7am in time for a short sail to the northern end of nearby Booth Island. 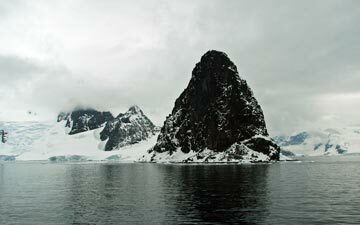 We had barely showered and eaten breakfast when we were off in the zodiacs again, this time heading across to the western side of Booth Island to visit Charcot Cove, where the French explorer of the same name had overwintered a second time in 1912, and home to thousands of gentoo penguins plus a few adelies and chinstraps. 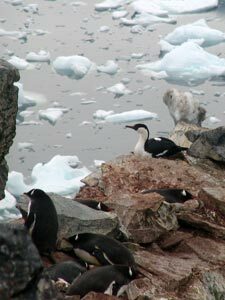 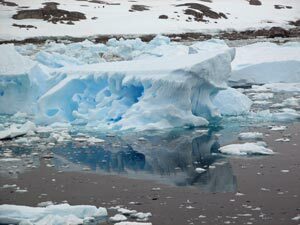 We landed alongside the penguin highway from the cove to the nesting grounds on rocky outcrops higher up and then climbed over the low saddle to take in the superb views of the cove, filled with small icebergs and floating sea-ice fragments. 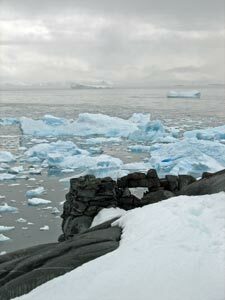 A little further on above the cove were the remnants of a stone hut used by Charcot almost 100 years ago. 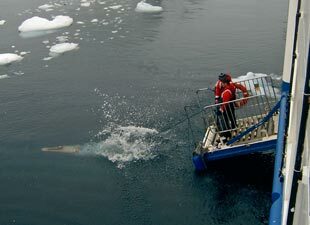 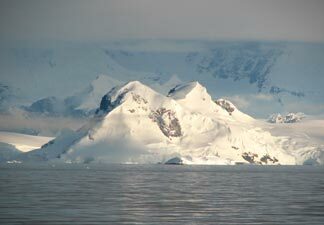 What is fascinating on this trip is that every part of the coast on which we land has had some association with the history of Antarctic exploration. 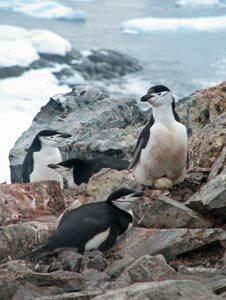 We climbed higher up the ridge above the cove, following the penguin highway past many rocky outcrops dotted with the pebble nests and brooding gentoos - the fishy smell of a penguin colony pervaded the air and the cackling calls of penguins drifted across from different directions. 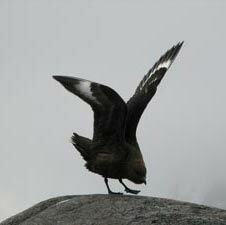 The odd skua sat imperiously on a rock knob, waiting patiently for a careless penguin to expose its egg. 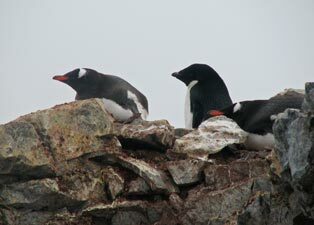 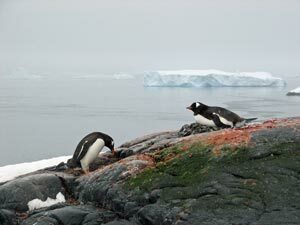 Near the top, we reached a stony gap that framed a view of the mist-shrouded mountains on the northern tip of Booth Island, across the bay from Charcot Cove, as well as housing a number of nesting blue-eyed cormorants. 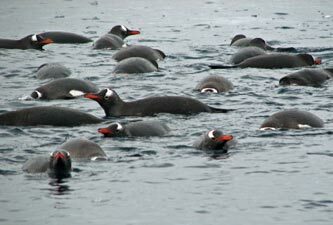 Here we finally found what we were looking for; a few adelie penguins and four pairs of nesting chinstraps amongst the thousands of gentoos. 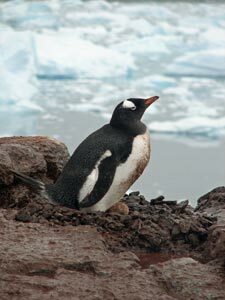 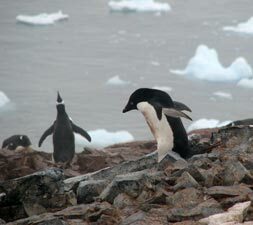 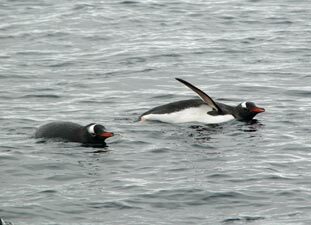 The gentoos appear to be faring well with the warming of the Peninsula area, increasing in numbers and spreading southward at the expense of the other two species. 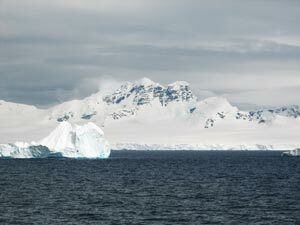 Below us the white expanse of snow sloped gently down from the saddle to the dark sea to form a long curving border of black and white, while above us the mountains and cornice -covered ice cliffs of Booth Island plunged steeply down. 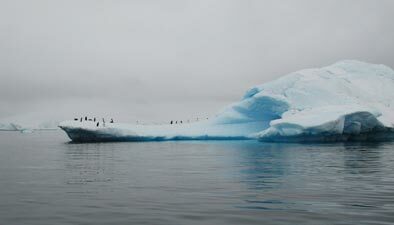 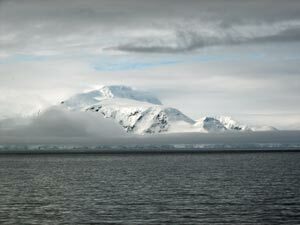 Once again, we felt awestruck by the stark beauty of this Antarctic landscape. 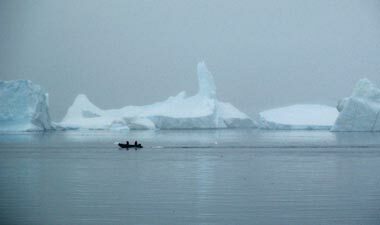 Our time on land up, we parallelled the penguin highway back down to the landing area and reboarded the zodiacs - it was time for a cruise amongst the giant icebergs that drift in and become trapped in the shoals and rocks to the west of Booth Island. 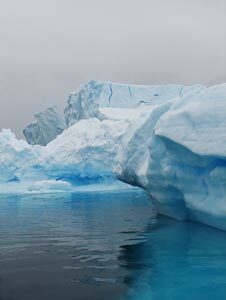 This area is the Sargasso Sea of ice - a collecting point of monstrous artworks carved by wind, wave and sun. 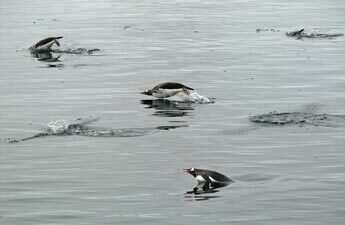 The zodiac skimmed across the mirror-smooth water to stop and drift amongst a large flotilla of gentoo penguins out for their morning swim and bath; a squabbling, splashing mass of birds, diving, rolling or just peering at the curious strangers swam around and beneath our drifting zodiac - an amazing sight. 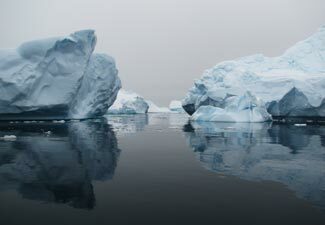 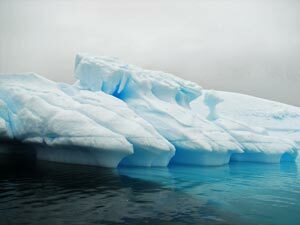 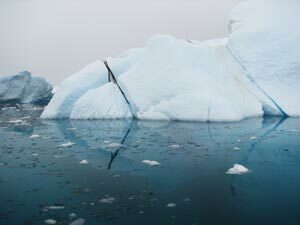 From here, we entered the world of the giant iceberg, wending our way past large blocks of ice, some floating but many anchored to the seabed, their waterlines etched away by tides, their bases a pale blue outline vanishing into the depths of the clear water. 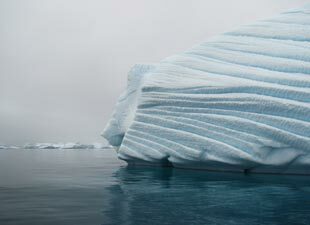 It was a magical voyage; people who had chattered excitedly watching the penguin flotilla sat in silence and awe for the next hour as we passed pale blue grottos, long corridors of chiselled ice walls, curiously striated and dimpled blocks, wierdly abstract sculptures and ice-castles formed by capsized tabular bergs, their shapes reflected in the glasslike dark surface of the water. 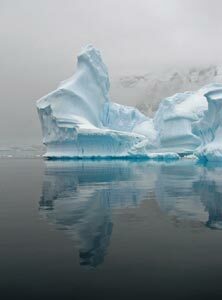 Nature is a magnificent artist! 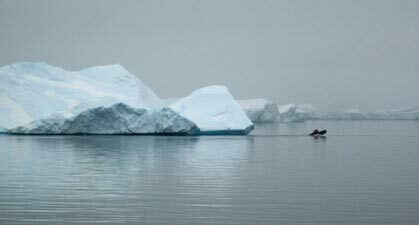 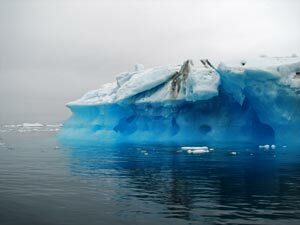 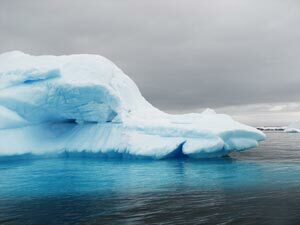 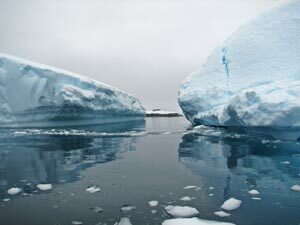 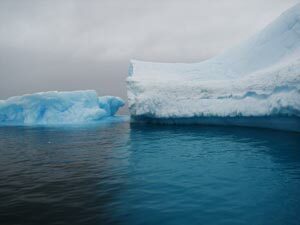 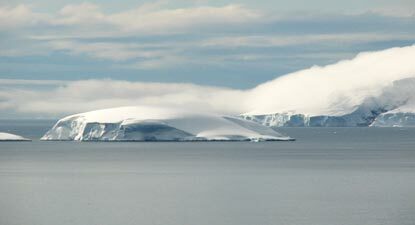 So sit back, imagine the absolute stillness and enjoy as we float amongst the icebergs of Antarctica!! 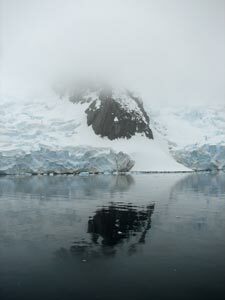 As we headed back to the boat, a gentle snow started to fall; once again we were learning about the vagueries of Antarctic weather. 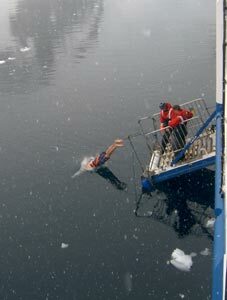 This only added to the bizaare scene that followed of twenty or so passengers jumping into the 4°C water from the ship's boat ramp for the privilege of a 5-second polar plunge to the great amusement and applause of those who watched (which, as we will no doubt later regret, included the fair Nello and myself!). 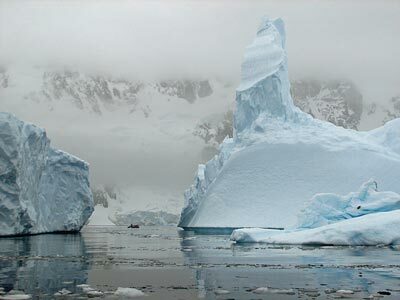 Time for a polar plunge! 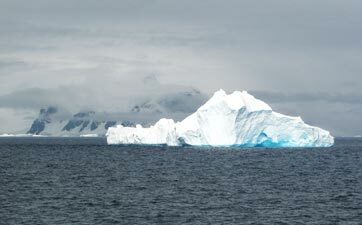 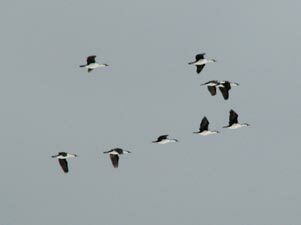 We then pulled anchor and headed off - not to Paradise Bay as planned, but a couple of hours northward to Orne Harbour. 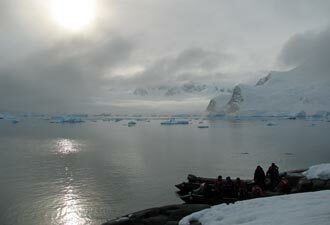 It is a fact of life on Antarctic cruises that plans are made and changed at the last minute as weather and current conditions are assessed. 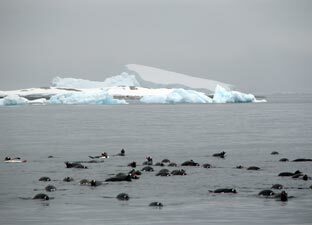 However, as tourism increases the number of cruise ships in any one area is also increasing and we had seen several vessels in the past few days. 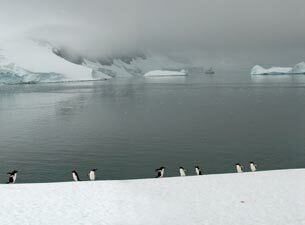 It was not weather that kept us out of Paradise Bay - we had simply been gazumped by another ship. 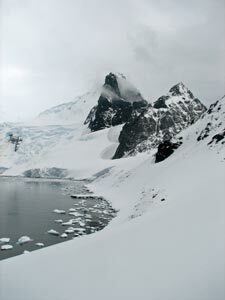 Orne Harbour, however, was a spectacular alternative landing on continental Antarctica; an inlet guarded by the impressive dark rock tower of Spigot Peak at one side, with steep internal walls and a glacier at its end. 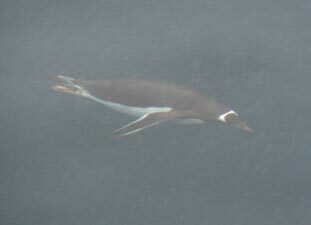 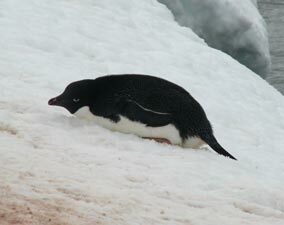 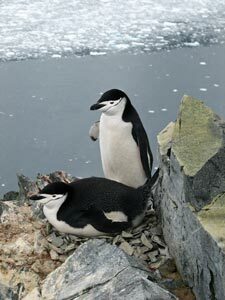 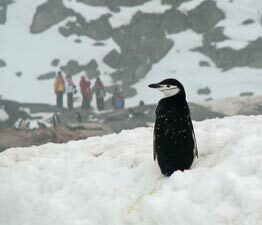 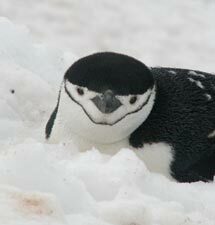 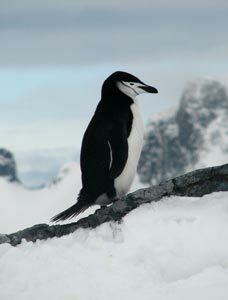 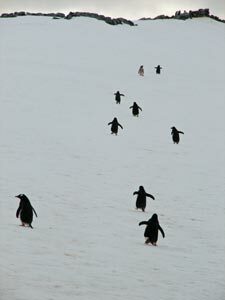 On a sharp ridgeline some 150m above the shore lay a colony of chinstrap penguins and, once landed by zodiac, a long line of people trekked up through the deep snow in large zigzags to reach the ridge. 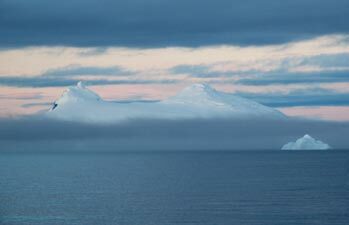 From here, not only could we see the chinstrap nesting sites, but the views back over the harbour, where the "Ocean Nova" looked like a blue toy boat way below, and southward, over the Gerlache Strait and Ronge Island, were quite incredible in the pale clear light. 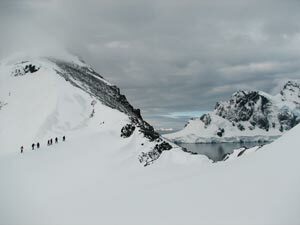 A small group of climbers headed off to ascend the rocky path leading to the top of Spiggot Peak while the rest explored the snowy ridgeline and soaked up the experience of wandering through the amazing landscape of continental Antarctica. 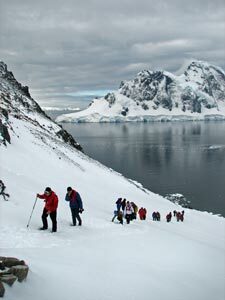 Out of sheer joy, we slid back down the steep snowy slope to the landing on our backsides - childhood relived! 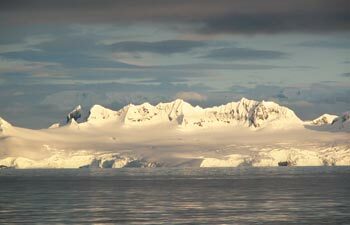 We sailed out of the harbour and headed northward - our time on the continent had come to an end and the sun finally broke through to illuminate the mountains of the peninsula and islands lining the Gerlache Strait as a final salute to our passing.